One of my favorite cat rescue groups is Michigan Cat Rescue. One of the humans who volunteers with them says they are small but mighty, and that is definitely true. They are a small all volunteer organization but they save many felines. 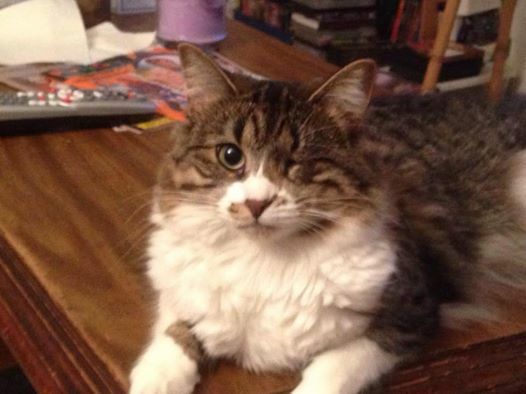 I first heard about this cat rescue group when I learned about Bindy, who was abused so badly that she lost an eye and the litter of kittens she was carrying. Michigan Cat Rescue helped her recover, and found a loving home for her. They also saved a cat from a cruel human who had taped it in a box and labelled it garbage. There are limits on what these kind humans can do, and sometimes, they must come to us for help. They rely on other humans to give them the green paper things they need to do their work and to help supply them. Right now, they are looking for something that isn’t expensive but that they need to do their work. What does Michigan Cat Rescue need right now? Paper towels. Now, you might be wondering, well, Bagheera, paper towels are useful, but why would a cat rescue group need them? That is a good question. Think about the messes that your felines make, and how you clean them up. When I eat my noms too quickly and I vomit, the human uses paper towels to wipe up the mess and then he uses a disinfectant wipe to make sure it’s clean. There is a donation box at the Classic Pet Supply store in Warren, Michigan where humans who live in the local area can give Michigan Cat Rescue the supplies it needs to do its work. If you do not live in the area, you can always donate green paper things. Let’s all work together to make sure that felines like Bindy and Treasure have an organization like Michigan Cat Rescue to help them. I have shared many stories of the things that Michigan Cat Rescue does. I think I first introduced you to them when I told you about Bindy. This poor girl was beaten to the point where she lost one of her eyes. Why was she abused so horribly? 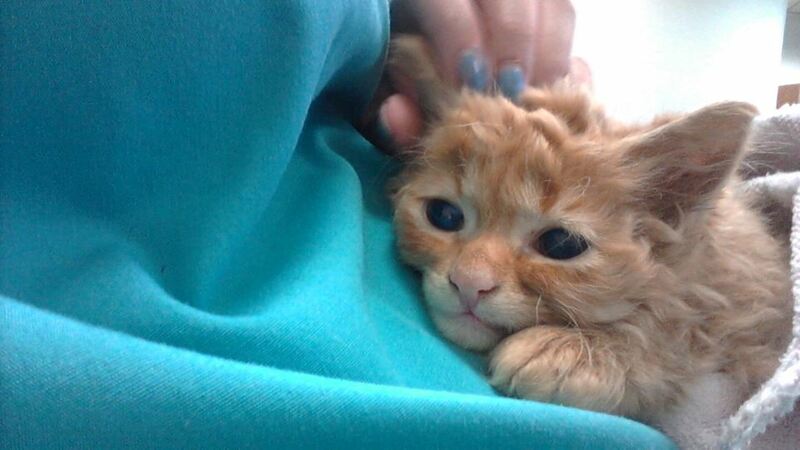 Because the humans who were supposed to care for her didn’t get her fixed and she got pregnant. There is never a reason to abuse an animal, my furiends, and this excuse was a horrible one. Bindy is now happy in a furever home, and she has learned to trust the very kind human who treats her like any feline should be treated — with love. And she gives that love right back. Now Michigan Cat Rescue is caring for another special needs cat. When he was rescued, he was drenched from the rain, scared, and confused. They took him to the humans in white coats and they learned that he was blind. The humans in white coats could not say if it was something he was born with, or if it was due to trauma as he was missing some teeth as well. Other than being blind and missing a few teeth, this boy was perfectly healthy and Michigan Cat Rescue has been nursing him to health. They gave him the name Mr. Magoo. When he recovers, he will be adopted to a home which is well suited to handle a blind cat. That means a home with adults only, no dogs, and maybe one other mellow cat to be his furiend. My house is full of felines right now, and I live too far away to bring in Mr. Magoo anyway. But even if I told the human take him in, it would not be good for him. With three bengals, it would be too much for him! Mr. Magoo has many applications for his adoption, so he will find a furever home for sure. Michigan Cat Rescue is only going to adopt him to someone in the local area, as they do not want to see this poor boy traumatized any more by excessive travel. But they have many other felines who are looking for a home, including some bengal mix kittens! One of the humans who likes reading what I say does some work with Michigan Cat Rescue and she said that they are “small but mighty.” And they are. Many of my fellow felines owe their lives to this cat rescue group. It is always sad for me when I have to share a story of horrible animal abuse. Even when the felines in question turn out to be okay, like my good buddies Lucky, Justin, Bindy and Treasure, it makes me very sad. I do not understand why evil humans enjoy torturing an animal. It doesn’t make any sense. If you do not like us, leave us alone, but there is no reason for animal abuse! What is even worse is when the humans abusing the animals are children. What kind of evil humans raise kids that think it is right to set a defenseless feline on fire? Sadly, that is what happened to Pascal, near where I used to live. He is a Baltimore feline who was rescued when a witness called the authorities and they took him to the animal shelter. The shelter could have taken the easy way out and euthanized Pascal. But they didn’t, and they treated his injuries. Pascal is eating his noms heartily and his human caretaker, who has lots of experience with burn victims, is hopeful that he will make a full recovery. Despite his horrible injuries and the cruelty he went through, he is a purring machine who loves humans. Pascal will need a lot of help recovering from his injuries, and it is likely to require lots of green paper things. But I know that many humans have helped so many victims of animal abuse and I hope that the feline loving community will do so again. If you can help, please donate to his care. And if not, please send healing wishes and share his story. This also reminds us that four legged and two legged creatures must unite to stop animal abuse. The human who reported Pascal’s abuse to the authorities did the right thing. And we must encourage law making humans to do the right thing as well, by enacting laws to form a national animal abuse registry! Please help so that no animal has to suffer through what Pascal is enduring right now.